Bettye Kimbrell was born in Fayette County in west Alabama. Her parents, Bradley and Pearl Whitson, were tenant farmers until her father began to work at a sawmill in Berry. After Bettye finished the first grade, her father moved the family—four children, with another on the way—to Berry. There her mother left Bradley and their five children for another man, an act with consequences Bettye has dealt with her entire life. For the next four years Bettye and her siblings lived with Bradley’s parents. Though Bettye felt unloved by her extremely strict and frugal grandmother, she learned a great deal about gardening, farming, housekeeping and quilting while under her care. When Bradley moved the children out of her parent’s house, the 12-year old knew how to cook and care for her four younger siblings. She met Calvin Kimbrell when she was 13 and married him shortly afterward, becoming a mother at 14. They moved to Birmingham in 1954 and soon afterwards settled in the community of Mt. Olive, 20 miles north of the city. Eventually she and Calvin had 5 children to support on Calvin’s pay as a house painter. Bettye dedicated her life to raising her children to be happy, productive individuals, using all she had learned from her grandparents about self-sufficiency to provide them with food and clothing—and giving them much more love than she had received as a child. In 1970 a trip to the quilt exhibit at the Alabama State Fair in Birmingham sparked an interest in quilting—not in making the efficient utilitarian quilts that her grandmother made but in creating objects of beauty. From that time to this, Bettye has been passionate about making hand-stitched quilts and wall-hangings and teaching others to do the same. In 1980 she founded the North Jefferson Quilter’s Guild that meets at the Mt. Olive Community Center. Shortly afterward she became the president of the community center as well as the guild and received support from Calvin Kimbrell in these duties. 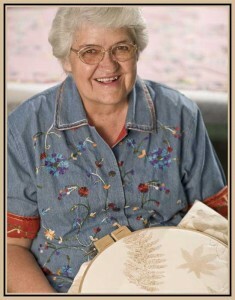 She annually won blue ribbons at the state fair, most of her entries also being named “Best of Show,” and her quilts have been shown at the National Grange headquarters, Disneyland, the Southern Highlands Craft Gallery, the Birmingham Museum of Art, the Kentuck Festival of Arts, as well as in exhibits in China and Europe. Besides teaching hundreds of people to quilt in the North Jefferson Quilter’s Guild, she has taught at Jefferson State Community College, John C. Campbell Folk School, the Alabama Folk School, and the Museum of Appalachia, among others. In 1995 Bettye received the Alabama Heritage Award from the Alabama State Council on the Arts and in 2008 she was named a National Heritage Fellow by the National Endowment for the Arts, both the highest honors a craftsperson can received on the state and national levels. Despite health issues and worries about her eyesight, Bettye continued to quilt and created some of her finest quilts in latter years until she suffered a series of strokes which lead to her death on October 18, 2016. Bettye told her fascinating story in Out of Whole Cloth: The Life of Bettye Kimbrell, published in 2013.